Our teachers and staff are the heart of everything we do. From the principal to the teachers, office workers, coaches, substitute teachers and teacher aides, each employee embodies our core values and makes CBS a wonderful place to work, teach, learn and grow. As a ministry of Calvary Baptist Church, Calvary Baptist School holds to a series of doctrinal statements that employees are expected to understand and be of like-mind with. Our core values and doctrinal beliefs can be found on our Philosophy & Mission page. Full-time or part-time job opportunities may potentially be available throughout the year, and open job positions will be posted on this page. If you believe you would be a good fit for Calvary Baptist School, we would be happy to speak with you. If you are interested in employment, please fill out a staff application. After your application is reviewed, we will be in contact with you if we are interested in pursuing you further. 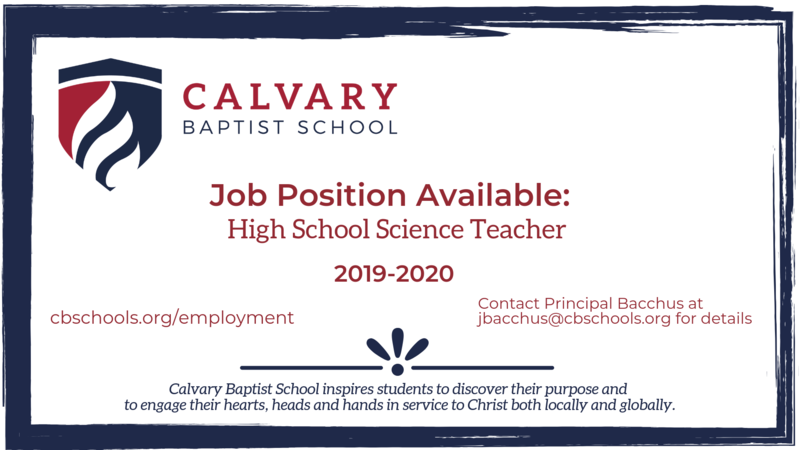 An interview will be set up with our principal to discuss your interest in Calvary Baptist School and the positions we may have available for you. If you are being seriously considered for employment, you will be directed to the school office to begin the hiring process which includes completing Pennsylvania state background checks and clearances as well as employee paperwork. If you are interested in employment opportunities, please contact us and send your resume and/or cover letter to the school office.